As I’ve said before, I’m not much of a baker. But for Valentine’s day, my other half said he wanted to cook me dinner so I decided to assume his role and bake instead. This recipe is from Tara, who in turn got it from a colleague when we worked together – we had a charity bake-off and this is the cake that won the contest. Quite rightly too; it’s incredibly light with a delicious hint of cinnamon. 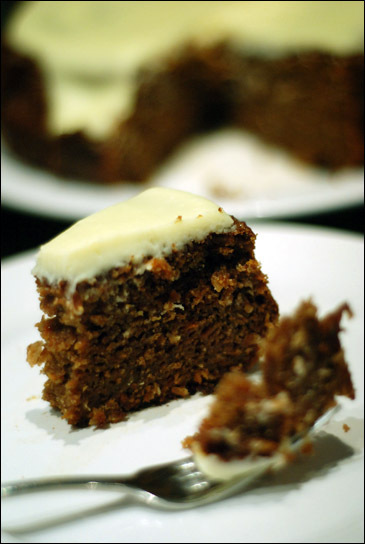 Carrot cake as it should be. Pre-heat oven to 150ºC. You will need one 25cm round cake tin, either greased or lined with greaseproof paper, and two mixing bowls. In the first mixing bowl place the eggs, oil,vanilla essence and sour cream, and mix them all together with a whisk. Then sieve the sugars into it as well, whisking in as you go to make an emulsion. In the other bowl, sift the flour, nutmeg, cinnamon, soda, salt, then fold in the dry ingredients into your sugar emulsion, followed by the carrots and coconut. Mix well to distribute everything evenly, then spoon into the cake tin and bake on the centre shelf for 1½ to 2 hours. After 1½ hours, put a skewer into the middle of the cake and hold for five seconds. When you pull it out it should be clean, but hot. If any cake mix sticks to the skewer you’ll need to bake it for a little longer. Once cooked, remove from the oven and allow to cool. While the cake is cooling, mix together your topping; I melted the butter in a saucepan and then stirred it in to the rest of the ingredients and then allowed it to cool a little before spreading thickly on top of the cake. Allow it to cool further for a couple of hours, then serve. I LOVE this cake! I just made it the other day but my frosting came out a bit lumpy - word of the wise, make sure the butter and cream cheese are at room temp. it's gorgeous! i took one into work last week and everyone wolfed it down. i've taken to cheating with the icing - zapping the butter in the microwave for 30secs or so, just so it's soft but not molten. cheat, moi? I made this in Grania's kitchen (whilst she made the chocolate cake) for both our boyfriend's birthdays, its amazing and even i managed to make it properly... even on two bottles of wine! thanks! bookmarking! do you think it'd be alright to leave out the butter from the icing? i'm sure it should be fine - maybe make up the difference with a little more cream cheese or it might be a bit runny.